After drinking way too much tea on Saturday evening and waking up several times, I found myself unable to sleep, so around three AM I stumbled down the stairs and loaded the car. Riley and I were on the road well before 4AM. This meant seeing some things I never thought I would, like North Conway in the pitch dark. I like to avoid McD’s but with every breakfast joint closed there’s no option. 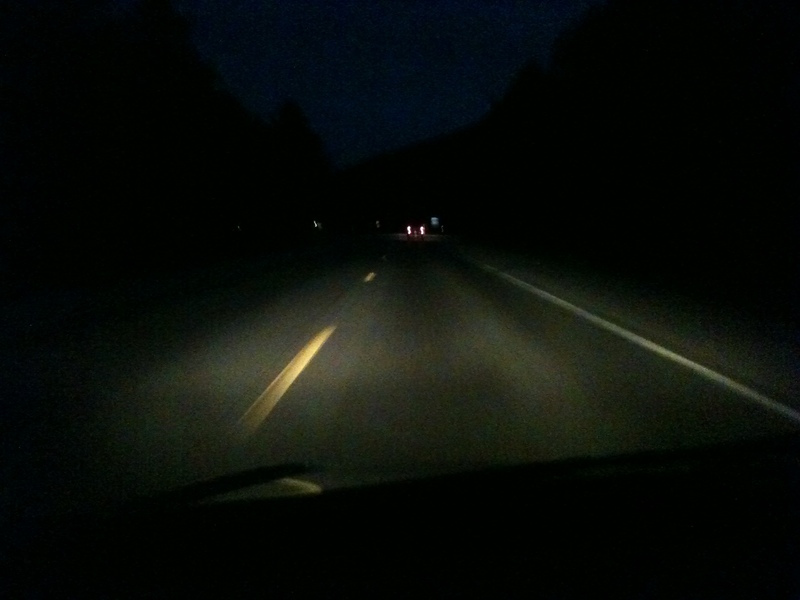 After more dark road, the sky finally lightened when we reached Pinkham Notch. At the 19 Mile Brook trailhead, there was some dawdling, dressing and eating our cooling McMuffins, then Riley and I put boots on trail before 7AM. During the hike into the forest, I noted two things; one that I planned to look at and another that I didn’t. You see, I was planning to bushwhack back to the 19 Mile Brook Trail from the south arm of the Imp Trail later on, and I wanted to note how open the forest was. It was mostly hardwood mixed with spruce, but with sections of open pine. It appeared to be pretty open, more so than the Black Pond bushwhack to Owl’s Head Mountain. But that whack has a herd path, and the Imp to 19 Mile whack does not. The other thing I noted was how the trail was torn up in several places by Hurricane Irene. There were spots that I have no idea how a trail crew will ever fix. It may be that the trail will just be ‘different’ from now on. Someday I will be on a trail crew so I might find out. Around a mile in, we reached the half-bridge caused by the hurricane. I looked downriver and saw the splintered other half among the rocks. Further along, the Carter Dome Trail begins and climbs a deep ravine to Zeta Pass between Mt. Hight and South Carter. It follows what I think is a relocation, then crosses its brook at a place where the hurricane damage is obvious in the extreme. The flooded rivers were pretty damaging to their banks, but they were especially violent around crossings. 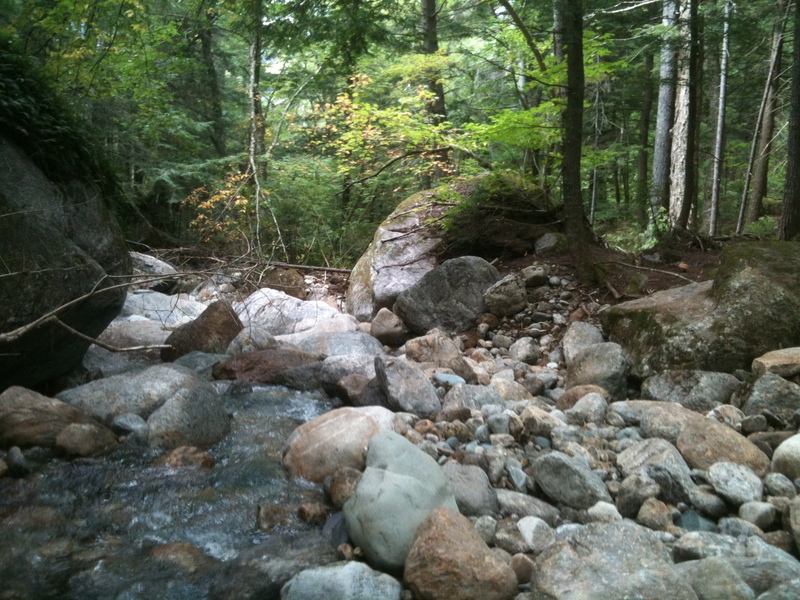 Where a trail crosses a brook, it opens the forest to the river, and the raging waters follow the trails as well as the riverbeds. 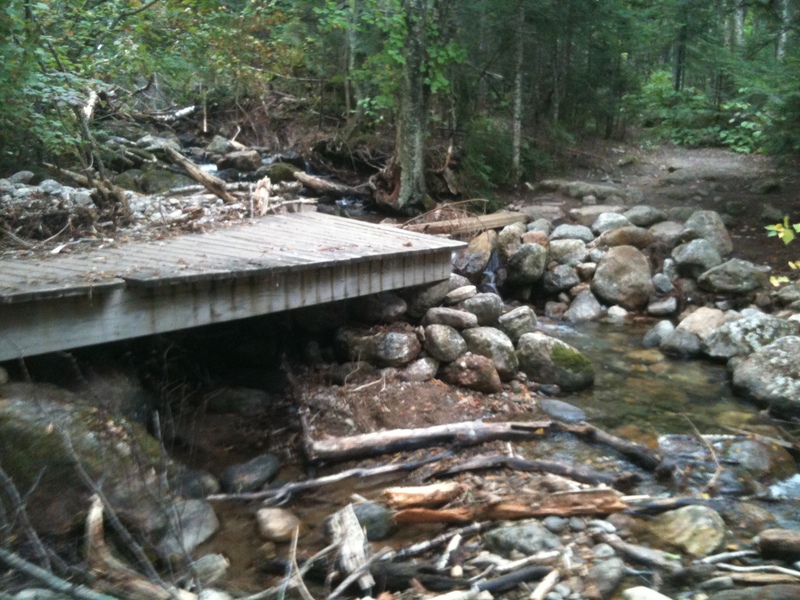 At most crossings, at least one end of the trail is headed downstream, so the trail is severly undermined and obscured. 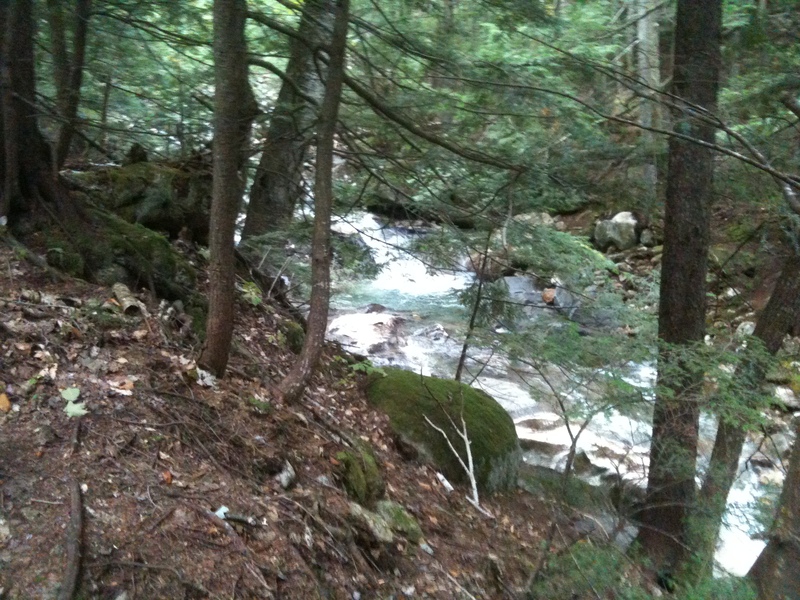 In this case, both ends of the trail headed downstream far enough for the crossing itself to be tough to find. But I learned only after spending a generous chunk of time looking for it. First, I looked upriver and saw a cairn, so I followed the ledges for awhile looking for the next cairn. I even built a few myself, all the while wondering why I only found one. Then I crossed and found a spot that appeared to be trampled, but it petered out immediately. I got back into the riverbed and looked downstream. It was Riley who saw it. “The trail, daddy!” she said. I told her, yes, that’s the way we came. “No, there!” she said, pointing to the other side, where sure enough, the trail started again after several yards of ravaged sandy riverbank and boulder field. We headed down. I destroyed all my cairns as well as the first one I saw, and built a couple more to define a sharp bend at the crossing. We got to Zeta Pass around 10AM and bulked up on raisins and warmer clothes. The ridge walk was on. From here it was a short climb to South Carter, where I never saw a sign, but it was an obvious peak with slabs of granite just to the west of the trail. We continued on to Middle Carter, with me carrying Riley, and I was purposely moving slow to avoid sweating. We ate our chocolate, crackers and raisins at Middle Carter around noon and headed down to the North Carter trail. 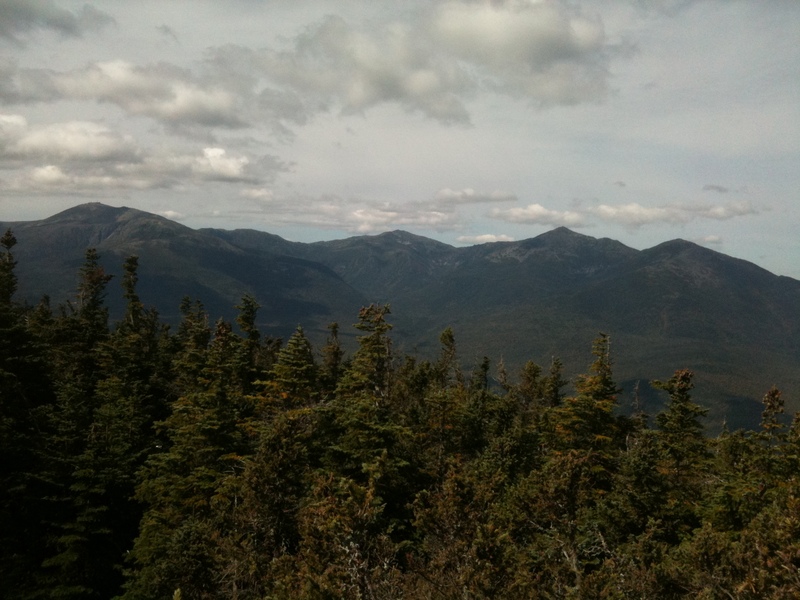 The summits themselves were treed in, but there were several spots on the ridge with fine views of the Wild River Valley on the east side and the Presidentials on the west. 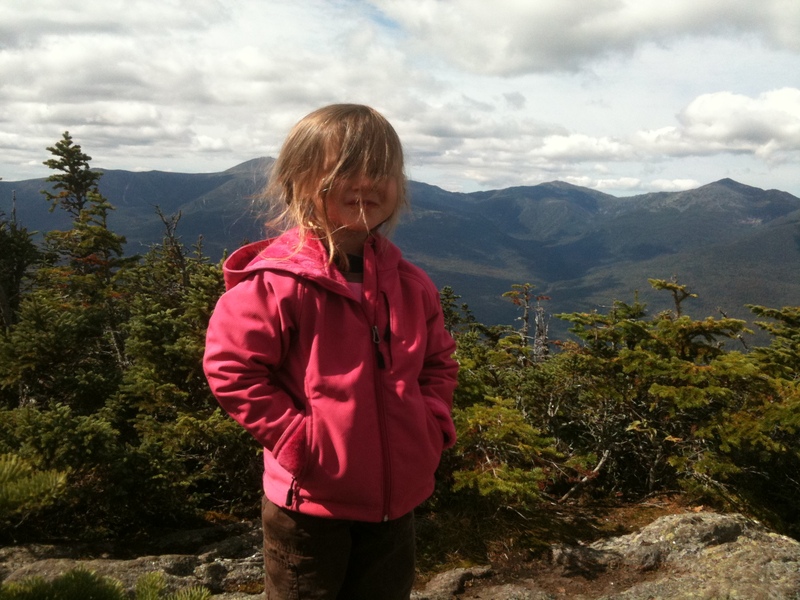 With the viewless summits, I have to say I would recommend this hike as a two-day ridge walk that includes Wildcat, the Carter Notch hut and Carter Dome. In fact, someday I might just do that. On the way down, we met another hiker, a marathoner, who was planning to reach 5 more 4000-foot summits before the 2011 season ended. We talked about hiking, running, kids, and the bushwhack I was planning to do. Since he had also parked at 19 Mile Brook, he asked to join me on this adventure, and I thought it was an excellent idea, especially considering the dangers inherent in this sort of thing. By my estimation, we would reach the point where the trail turned north at around 2:20PM. We were in the middle of talking about Boston Marathon qualifying times when suddenly we realized we could hear the stream, Cowboy Brook. The trail turned north (confimed by compass). The forest around us ‘felt’ like a 1900-foot forest. The contour looked like the map. So the bushwhack was about to begin. I was told by hikers on Middle Carter that there would be a small path leading toward the brook, but I also knew that most advice about this whack involves either an old or a new logging road leading to Camp Dodge. Sans path, Marathoner and I dropped toward the brook through mostly open pine, easily crossed it, scrambled up the steep bank on the other side, and started following our bearing. My USGS contour map shows a low, broad ridge running west with a narrow hump at the west end, toward the parking lot. The hump separated us from 19 Mile brook and the lot, and was steep on the other side. A bearing of 290 headed straight toward the lot, but down the steepest part of the hump, while 275 skirted its southern side and dropped to 19 Mile about a tenth from the trailhead. The forest thickened with birch and maple saplings. Bushwhacking isn’t only about swiping through saplings and bushes, but also about spider webs. 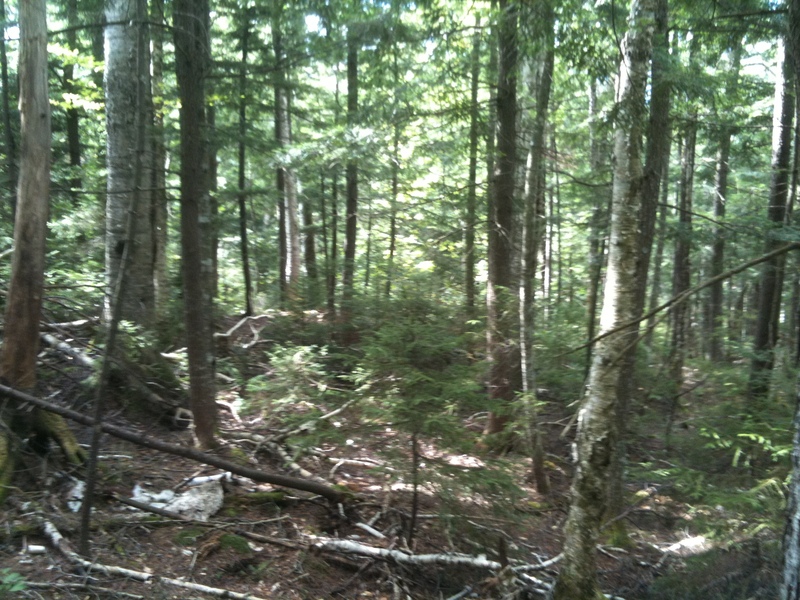 Halfway across the ridge, we crossed an overgrown logging road. It was pretty obvious as a long clearing that arced toward the north, with double ruts underfoot. It was probably heading for Camp Dodge. We crossed it and ducked into the thick woods. The sun at 2:30PM seemed to be about 5 degrees or so south of our track, so following it was an easy way to cheat. There were some clouds, but luckily I was carrying the kind of compass that works even without sun (that’s a joke, folks). The thick woods continued for awhile and we started to climb slightly. Soon enough, we reached the hump and its steep west side. The forest opened into large pines, and after crossing a marshy area at the bottom, the grade eased, the saplings thickened again, and 19 Mile Brook came into view. It took maybe 30 minutes to cross untracked (at least in a few years) woods covering about 7 tenths of a mile. We followed the trail to the parking lot, reaching it after about a tenth, as planned. Marathoner was on his way, with the Kinsmans, Garfield, Carrigain and Jackson still to reach this year. Great choices to finish. Good luck with those 5 peaks! A thought about bushwhacking: I would have never tried it unless the terrain was fairly simple, like an obvious ridge or brook bed; not too steep, since at some point a hillside becomes exposed boulders and cliffs; and not too far, for obvious reasons. I’m sure this seems like a minor accomplishment, like successfully brewing a pot of coffee, but it was pretty important to me to nail this bushwhack. To answer the questions: Why? What do you get from it? I can only say: Why does anybody do anything? This entry was posted in Childs' Play, Family Posts, Hiking and tagged 19 mile bushwhack, bushwhack, carter bushwhack, carter hike, carter range, carter range bushwhack, hiking bushwhack, imp bushwhack, middle carter bushwhack, middle carter hike, pinkham bushwhack, south carter bushwhack, south carter hike, white mountain bushwhack by Tom Bishop. Bookmark the permalink.